Game Two of a young season, and things went less well today after a solid (albeit slightly fortunate) opening day win. A few things were ruined, such as the early-season ERA's of a bunch of Astros' pitchers and the April run differential. Thankfully, only one loss was put in the loss column. The Yankees struck often and early, watched as the Astros made the game interesting, then pulled way to win in a laugher. Astros lose, 16-6. Collin McHugh, who took a month or two to stabilise last year, struggled. It didn't help that the first batter of the game reached on a catcher's interference call. The remainder of McHugh's outing went walk, walk, RBI single, 2 RBI double, RBI grounder, RBI single. For those keeping score at home, that resulted in six runs (five earned) in one-third of an inning pitched. The RBI double and the second of the RBI singles were especially galling - in the former, Brian McCann took a low curveball well out of the zone and golfed it down the RF line. A little more inside, and he may have swung over it. In the latter, Chase Headley won an 11 pitch at-bat, fouling five consecutive pitches off before hitting a seeing-eye grounder past the mound and up the middle. 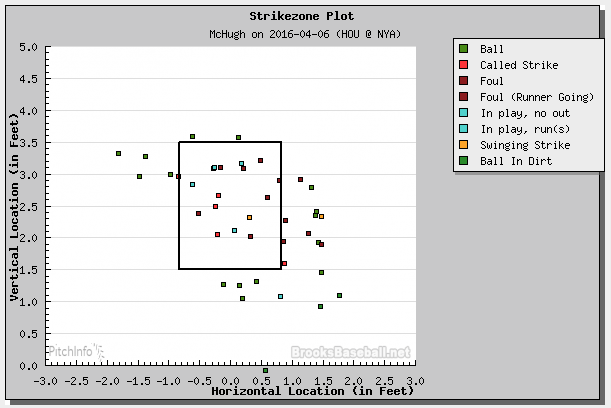 But this analysis is really just to make us feel better about McHugh's performance, but it simply was not good enough. He went to a 3-2 count on the first four batters he faced, and five of the seven total. When McHugh pitches badly, it often looks like this - he relies on a high fastball on the corners and a sharp breaking ball, and when the he doesn't get the calls and the breaking ball gets a little slurvy, the resulting contact can be a problem. Michael Feliz relieved, and immediately allowed Chase Headley to steal second. Headley then scored when Starlin Castro had the first of his four hits. Didi Gregorius followed with a single, then one out later, Brett Gardner walked before A-Rod flew out to right. That ended the inning that went on for 36 minutes, 62 pitches, and saw 12 Yankees batters head to the plate. Feliz was nearly handed a whole new ball game, when he entered in the bottom of the second trailing by only one run. But a single and a walk were sandwiched around strikeouts to start the frame, and with two outs, Starlin Castro hit a long home run deep to the LF power alley. That scored three - the pitch was a hanging slider away. The following inning, Mark Teixeira was the architect of a three-run home run, which was a long upper deck shot to RF on an inside fastball. So if you are keeping score at home - and I don't blame you if you stopped - the Yankees managed six in the first, and three each in the second and third innings. Feliz settled down a little, and he was pulled after 107 pitches with one out in the fifth. Sipp threw an inning, allowing a solo home run down the LF line by Carlos Beltrán on a high fastball away. Fields relieved Sipp, and but in the seventh he gave up a three-run frame on a fly-out, single, single, 2-RBI triple, RBI single, fielder's choice, ground-out sequence. Pat Neshek pitched the eighth, and he set the Yankees down in order for the first time on the night on 11 pitches. Perhaps he should have started. The pitching woes threatened to overshadow the solid offensive night the Astros had. They opened the scoring when Carlos Correa mashed a breaking pitch to LF in the first. Valbuena singled, Tucker doubled and Altuve was HBP in the second to load the bases with two outs for George Springer, and he hit an 0-1 breaking pitch to LF for the first Astros' Grand Slam of the year. (I seem to recall that it took until Aug 1 against the D-Backs last year for the Astros to record a Grand Slam). That made the score 6-5 at the time, and it looked like the 'stros may make a game of it. Carlos Correa hit a long home run in the fifth, 462' off the dead CF batting eye on a cut fastball inside that didn't cut. But that was all the scoring the Astros could muster, and the game was well gone by then. Correa had an incredible night at the plate. He went 4-5 with two home runs, and two hard-hit singles. Like Collin McHugh, he is due for some regression - he is unlikely to stay on pace to hit 243 home runs this year is what I think. Colby Rasmus continues to look good - he recorded two hits, one of which was a double. Tyler White was also strong, going 2-4 to continue his great work in the major leagues. Preston Tucker, DH-ing for the second day in a row, laced a double in a 1-3 night. Castro and Gómez remain without any hits on the year. Gómez has looked brutal, and he continued tonight, going 0-4 with one strikeout and one GIDP. That means he has managed to recorded 9 outs in the season on 8 plate appearances. Castro's contact problems continue - he looks awful against velocity - as he went 0-4, 3K. Stalin Castro's long home run in the second scored the Yankees' seventh, eighth and ninth runs, and put the game out of reach for the 'stros. Sigh. At some point this season, we will anoint someone other than Carlos Correa as MoTM. Not today, though. Correa is hitting .556/.556/1.556 on the year. Anyone throwing the ball from that bump-y thing in the middle of the diamond-y thing for the Astros, excluding Pat Neshek. A bunch of Astros have ruined their early-season ERA's. McHugh's, for example, sits at 135.00. Ouch. 4 Eastern, 3 Central. Then a flight to Milwaukee for a series against the Brewers. I have always worried about McHugh occupying a top of the rotation spot. He's a decent pitcher, but his W-L record last year is deceptive. I really don't think he is any better than Fiers, Feldman, or Fister. It would have been great if they would have picked up a solid top of the rotation pitcher in the offseason to go with Keuchel.